So here are some pictures of me with my folder! Mine is a blue Raleigh Twenty, which according to the serial number is a 1975 model. I've re-built it using a lot of scrounged parts. 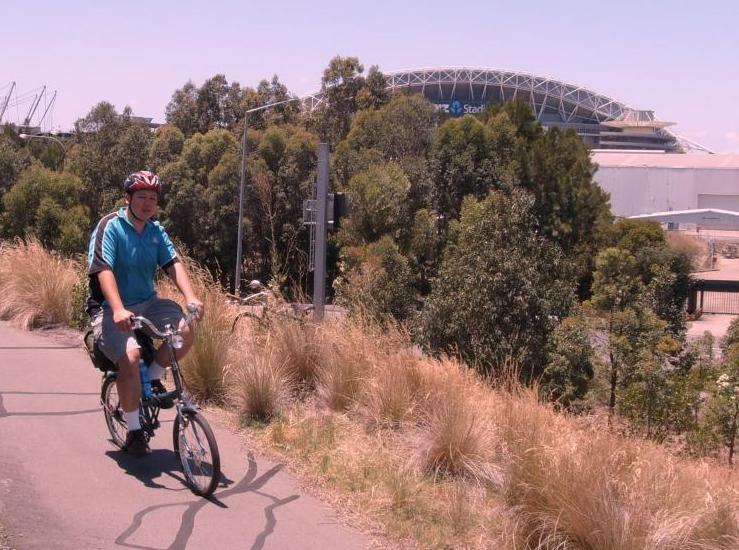 Left - Riding along the river at Sydney Olympic Park. Below-Right - Sydney Olympic Park - ANZ Stadium in the background. Below: In front of the garage door. There have been lots of changes made since these pictures were taken - it is still a work-in-progress, but I hope to have something presentable in the not-too-distant future. The general plan is to re-built it as a touring bicycle which I can fold into half for travel by train/bus to start/end points, without having to pull it to pieces. The Raleigh looks exquisite, I like it more than the red unfolding (!) one. Big news! Pashley arriving in time for the next Tweed; naturally you will be among the distinguished few (one in fact) who will be offered a test ride. 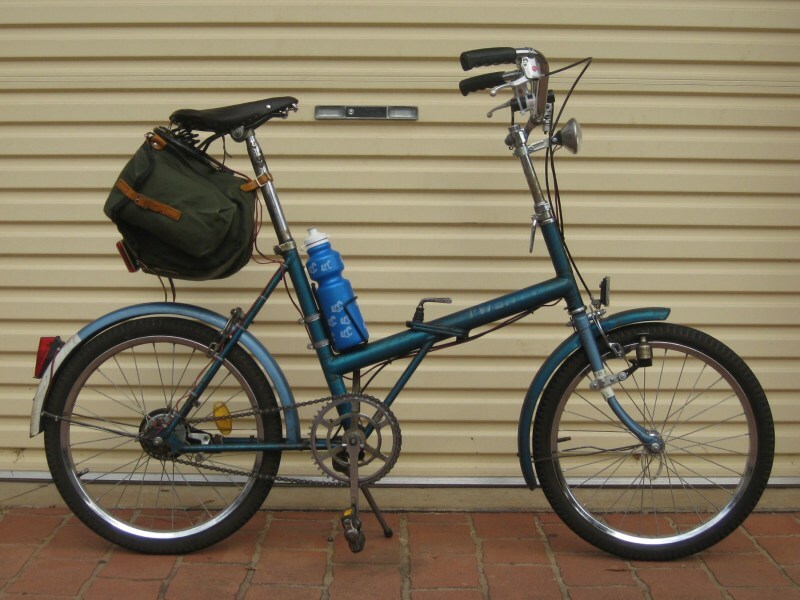 My Raleigh Twenty will soon acquire a set of drop handlebars and a 5-speed hub for use as a folding sport-tourer. I am also working on a method where it would be easy for me to swap over to flat bars without too much work. I understand the newer 5-speed SA hubs ( X-RD5-W) are wide ratio (0.63 - 1.6), as on the Pashley, which has a slightly wider range than a Shimao 7-speed (0.63 - 1.55) . My feeling is the gaps between gears are getting a bit large - the narrower range 5sp (0.66 - 1.5) might be more practical. I've rounded the figures to two decimal places here. Sheldon's gear calculator has been updated to include a lot more hubs than previously, but no doubt you know about things like this long before I do. Surely just a stem with removable clamp plate would solve the handle bar change-over problem? I'm hoping that the supplier I am buying from has the older ones with the narrower gear range. The removable clamp plate is one thing easily solved, but the brake and gear cables are what complicates matters. What about setting up two complete handlebars with duplicate levers, shifter, bell, etc then you can swap the bars using the removable clamp plate and that leaves the two brake and one gear cable to connect which is not especially quick I know, but may be simpler than re-mounting things on the bars each time. 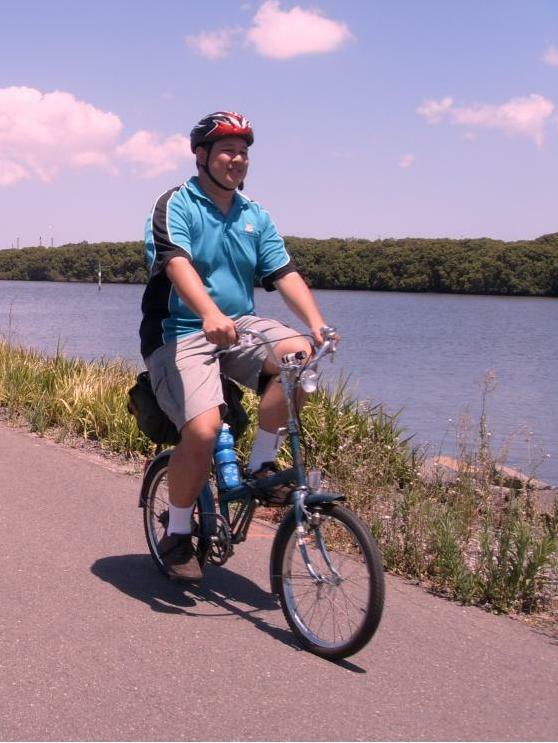 Percy (my brompton) and I after a centennial park brompton lap record attempt last saturday. Good to see that you finally got that folder after oggling my Raleigh Twenty for so long! What a great classic british name for your brommy. How did Percy go on the lap time? The lap record attempt was 6 mins 31 sec. I'll call a provisional record until I can find another Brompton rider who wants to challenge it. Although I'm aiming to go sub 6mins. Wow! lovely! my 6 year old wants a blue brompton for her (10th-or whenever she can ride it!-(might be fiddling with the handlebars and seat in the interim!) birthday! Im about to pick up a 6speed outfit like yours (only 8 months old) but in black for $1000...now to find someone who can change the colour..